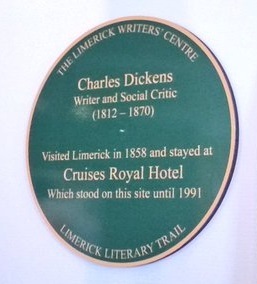 On the 6 May 2016 a plaque was unveiled to commemorate the visit of Charles Dickens to Limerick in 1858. The plaque was erected by the Limerick Writers Centre. We were asked to say a few words about Limerick in 1858 to set the scene for the visit of Mr Dickens. 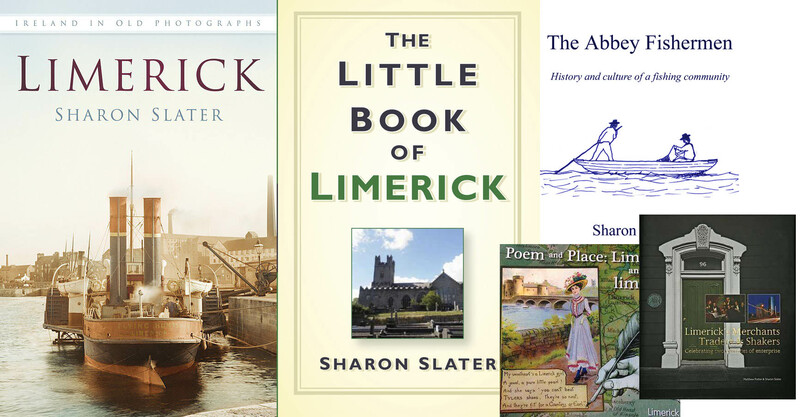 Limerick in 1858 was a real Tale of Two Cities. There were those who could afford to go see Mr Dickens and those who could not. On one side.. the city was a rich and vibrant place to be, with lots of employment in the many factories. The girls and women worked primarily in the Limerick Clothing Factory and the Limerick Lace factories, while the men and boys worked in the Bacon Factories, on the Docks and in the Mills. Our very own Michael Hogan “The Bard of Thomond” worked in Russell’s Mill on the Canal at the time. While his poems were being published in the local press. This was the year the railway station building opened, so you could now travel to the Dublin by carriage, boat and train. Outside each of these areas hawkers would be plying their goods to incoming visitors. The mail from Dublin arrived at 2:55am and 2:05pm and was sent out at 11am and 9:05pm each day from Rutland Street. The Georgian houses were still occupied by well-to-do families with an army of servants living and working in the main streets… causing the city to have a constant hustle and bustle. Each of the houses had access to the sewer so household waste was not going onto the street. The streets though were still filthy as they were made of a clay and stone mix which would become dusty in the summer and slippy in the winter. Not to mention all the animals roaming the street, be they horses pulling carriages or those on their way to the many factories in the city or to the Markets which were held each Wednesdays and Saturdays, while large Fairs were held four times a year. Mr Dickens himself noted the water fowl waddling around even the wealthier areas. The newer Georgian area had plush drapery stores, theatres, social clubs and balls. The Mayor at the time was Edmund Gabbett and families such as Spaight, Barrington, O’Mara and Tait were noted in the city. Cannocks reopened that year after an extensive rebuild, with fancy wears of every description. The apprentice staff lived in the building, as they did in most city stores, so even during the night it was alive. There were five newspapers at the time, the Limerick Chronicle is the only one that remains today. The newspapers were filled with quack medicine for all ailments as well as local gossip and news from further afield. There were only three dentists in the city while we had five rope makers. On the other side though, the city was thronged with poverty, although the famine ended eight years before, the effects were still being felt throughout the area. The older sections of the city in Englishtown and Irishtown had become derelict after those who could afford to move to the new Georgian area did. The area experienced extremely poor sanitation and large families sharing single rooms. Infectious illnesses such as TB and Cholera were rife. Thousands of families from the outlying countryside made their way into the city to either to enter the workhouse or to board a ship sailing for America or Australia. The Workhouse now St Camillus; the “Infirmary now LCFE;, Fever and Lock Hospital now St John’s; Magdalene Asylum now the Art College, Lunatic Asylums now St Joseph’s and Foundling Hospital” were all packed to capacity and beyond. St Bridget’s Burial Ground also known as The Yellow Hole became the last resting place for the poorest in the community who ended their days in the workhouse. While Mount Saint Lawrence cemetery had recently opened for those who could afford it. The population of Limerick city and county dropped by 50,000 from quarter of a million between 1851 and 1861. That same year Lola Montez, a woman of Limerick heritage, who caused the abdication of the King Ludwig of Bavaria also stayed at Cruise’s Royal Hotel and spoke at the Theatre Royal. Dickens would have been confined to the wealthier areas of the city, though as the city was a hive of activity he would undoubtedly have seen all classes of citizen. He would have recognised similarities in the city to the places described in his novels.